Mutare Polytechnic principal, Poniso Watema has saluted seven students who died before they could graduate, saying the institution will always cherish them and their love for the college. Five of the late students; Mongikazi Tshabalala, Thulani Takudzwa Murwira; who also posthumously won the best student award in Applied Arts and Sciences Division, Melody Madzvamuse, Cephas Makore and Cephas Makore died in road accidents. The other two students; Bete Bee and Nicolas Mupoperi died of other causes last year. Addressing guests who attended the college's 29th graduation ceremony, Watema said the polytechnic was still mourning the death of the students. 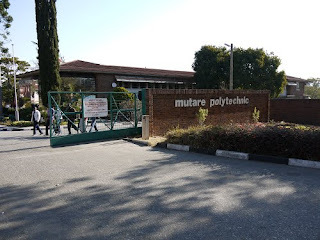 "Regrettably, the past year has been a bad year for the polytechnic; the institution witnessed the death of seven students and graduands, five of whom perished in road carnage. In as much as we accept death as a natural and inevitable occurrence, we still feel sorely touched when we lose any of our students. "This is especially so after their families and the nation had invested so much in their education and training in the hope that they will play their small part in the socio-economic development of the country," said Watema. In his speech, the Minister of Higher and Tertiary Education, Science and Technology Development Professor Amon Murwira said institutions of higher learning must look at their natural environment and draw innovative inspiration from it. "Like I always say, use heritage to develop competitive knowledge to contribute to development, use your local environment to teach and innovate. Here you have mountains, be specialists in them, use them to develop your studies. "In Zimbabwe, we have minerals like gold, diamonds, and platinum. We must therefore be the best in gold, platinum and diamond technology," said Murwira.